Top achievers from a Teesside college have been recognised in an annual awards ceremony celebrating the rising stars of the future. 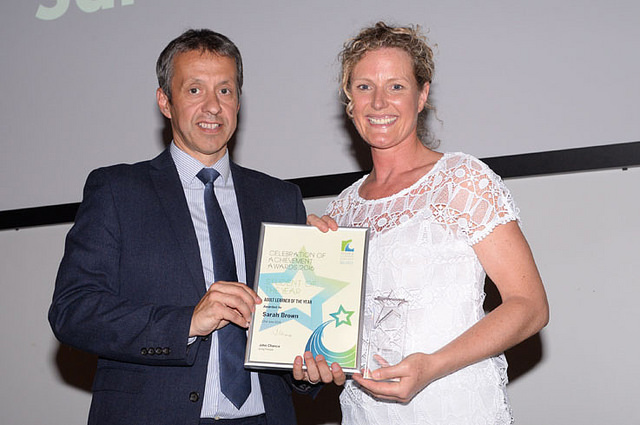 Winners included Sarah Hill, who took the Supporting Teaching and Learning in Schools gong for excelling during her placement at St Bernadette’s Primary School in Nunthorpe. Meanwhile, the Higher Education and One Awards Learner of the Year Award went to Sarah Brown (pictured below). Sarah commenced her learning journey on the Gateway to Access (Pre Access) course at Redcar and Cleveland College before attending the Access to Higher Education Diploma - Health pathway. She has successfully gained a place at Teesside University on the Operating Department Practice‎ Dip HE commencing September 2016. Carpentry and Joinery student, Aaron Boyd scooped the Apprentice of the Year award after representing the college at the annual skill build competition for the North East region. Aaron went on to win gold at the competition, beating off competition from over 22 colleges. Other notable successes included Chloe Whitney, who won both the Health and Social Care and the Further Education Student of the Year awards after battling ill health and continuing to support other family members.